September 22nd, 2015 | Moving Tips, Packing Tips. You’ve packed up almost all of your belongings for your upcoming move, but you don’t know how to transport valuable artwork. Paintings and framed can add stress to your packing list. 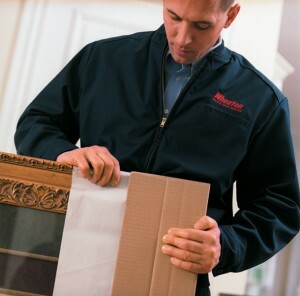 Mishaps occur during moves, and the risk of transporting valuables makes it difficult to guarantee the flawless protection you need for artwork. However, when you take these simple steps to pack artwork carefully, you can ensure your home’s art will arrive at your new place in the best shape possible. Hire Professionals or Do It Yourself? Most moving companies provide packing services for customers like you. Many companies have special procedures for packing fragile artwork, mirrors, and antiques. If you choose the right moving team, you have nothing to worry about. You can trust that they have experience packing valuables and that they ensure your artwork makes it to your new home safely. If you do decide to pack your artwork yourself, use these tips from the professionals to get your valuables into your new home safe and sound. Moving boxes slightly larger than the artwork. You might even invest in picture boxes, adjustable moving boxes made specifically for transporting artwork. Cardboard tubes for any unframed canvases, paintings, or posters. You can buy these at packing stores, the post office, or online. You can also stop by your local craft or hobby store and ask if they have any extra tubes lying around. Bubble wrap or corner protectors for wrapping the artwork. Packing paper to cushion the artwork inside the moving boxes. Flat sheets of cardboard to lay over the framed paintings. These should be just larger than the painting itself. Masking tape or blue painter’s tape to protect glass. Packing tape to close the moving boxes. Permanent markers to label your containers. How Should You Pack Your Artwork? First, make a list of all the artwork you intend to pack. An inventory will help you keep track of the artwork and estimate its value in case of an emergency. Depending on the value, you may consider insuring the artwork against the move. Lay the artwork out on a flat surface. As a precaution, use either masking tape or blue painter’s tape to mark a large X across the glass of the artwork. Should the glass break, the tape will keep it from shattering and damaging the artwork beneath and the other items in the box. For artwork not covered by glass, place a sheet of packing paper over the painting. Do not use printed newspaper, because it will leave ink marks on the painting. Place a sheet of cardboard over the glass or painting. The sheet should be slightly larger than the painting. Put protectors on the corners of the frame or canvas. Then wrap the entire frame in bubble wrap and tape it down to secure the bubble wrap from shifting. Crunch up packing paper and place at the bottom of the moving box. Place pieces of artwork vertically in the box, not lying down on top of each other, and place crumpled packing paper on each side. Repeat steps one through six with each piece of artwork. You can pack multiple pieces of wrapped artwork in the same box as long as you place a cushion of crumpled packing paper between each one. Close the box up with packing tape and label it as “Fragile.” List pieces of artwork on the side of the box to help you locate specific pieces once you are in your new home. Follow these steps and you won’t have to worry about breakage or damage to your artwork. You can expect that each piece will arrive ready to be hung in your new home.